In Part 1 of this series on sustainable home food production, I promised regular updates that could be collated to create a resource that I believe will be a valuable reference tool. In this instalment I will be discussing nitrogen, and all of its nuances. Home gardeners often think of nitrogen in terms of chemical fertilisers like urea, but it is simply a mineral, and a hugely important one at that. Nitrogen is the most abundant mineral in the plant, so if it is ignored or mismanaged, there will be a price to pay. Too little nitrogen in your garden will create spindly, yellowing plants, lacking vigor. Too much nitrogen creates a calling card for insects and disease, while also shutting down minerals like calcium and potassium that govern quality and flavour. There is also an issue with the forms of nitrogen. A healthy, resilient plant should contain three parts ammonium nitrogen to one part nitrate nitrogen. To achieve this important ratio, we must ensure that the majority of our nitrogen is either grown, harvested from the atmosphere, or recycled from crop residues. The nitrogen from these sources comes in the ammonium form, which helps to achieve this productive and protective ratio. Nitrate nitrogen is always uptaken with water, so if we overdo this form in our gardens, we dilute nutrient density and create a watery, mineral-deficient plant that signals party time for every insect and his dog. This happens most often when we overdo nitrogen from a bag, even if it is just chook manure. So, how do we ensure an adequate supply of natural nitrogen? The key to growing nitrogen is to plant a green manure crop in your garden whenever an opportunity presents. 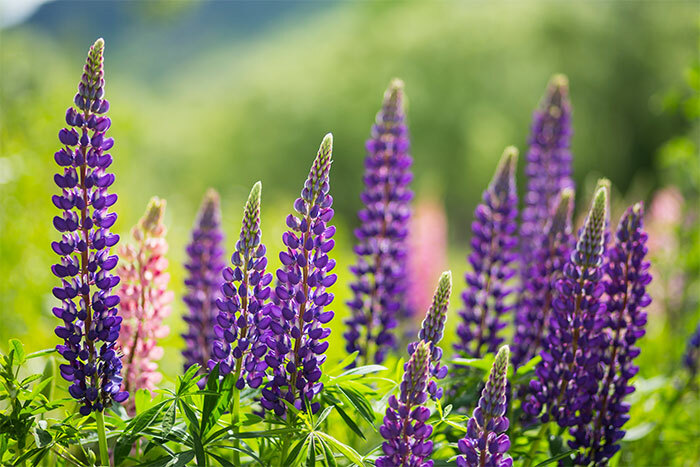 This typically involves a legume, like lupins, which are grown out and turned into the soil, just before they set seed. Legumes feature nodules on their roots that house nitrogen-fixing organisms and they provide a substantial nitrogen boost for the subsequent vegetable crop. A large bulky legume, like lupins, will also provide a rich feast of organic matter for soil life, and the earthworms will flourish. There is another strategy for growing your own N, and this one provides several other benefits. It is a great idea to position lucerne plants dotted throughout every garden. These legumes can be consumed as highly nutritious and alkalising leaves for your green smoothie. The flowers are an absolutely delicious snack or salad additive and you can also cut and drop the foliage from time to time, to create the very best mulch available. Lucerne mulch attracts earthworms which, in turn, produce castings that feature ten times more nitrogen than what is found in the surrounding soil. The lucerne plants will be constantly providing natural nitrogen to the surrounding food plants, but they will also increase the availability of two other, very important minerals – calcium and phosphorus. Legumes release acids from their roots, which break the bond between locked up calcium phosphate in your soil, and this renders both of these minerals plant available. Photosynthesis is the most important process on the planet, as it is this process that produces the energy ultimately used by all living organisms. The most important minerals that drive this critical process are calcium and phosphorus. The better your plants are photosynthesising, the healthier and less pest-prone they become, so get into peppering those lucerne plants throughout your gardens. You can source the seed from organic seed suppliers like Diggers or Green Harvest. There is one critical trace mineral that determines your access to atmospheric nitrogen, or what I call the “free gift”. This mineral is missing in 85% of the farming soils we test around the globe, so it is safe to assume that home gardens are similarly deficient. Nitrogen-fixing organisms make an enzyme that allows them to convert nitrogen gas from the atmosphere into ammonium nitrogen in the soil. This enzyme is called nitrogenase. The production of nitrogenase requires molybdenum, that missing trace mineral. 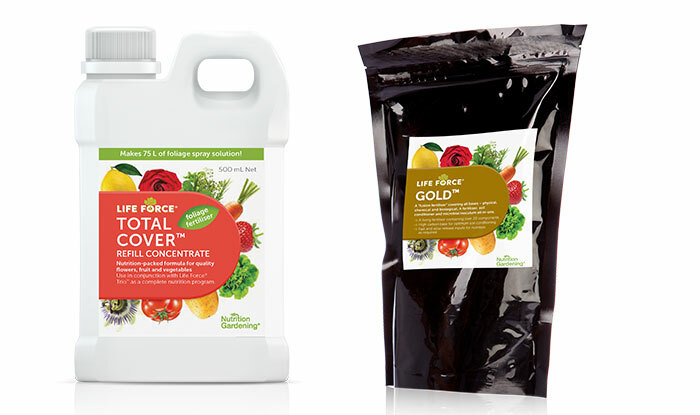 Most home garden fertilisers do not include this mineral, but our Life Force® Home Garden Range has two fertilisers that are rich in molybdenum. These include a liquid fertiliser called Total Cover™, and an all-inclusive, soil regenerating, composted fertiliser called Life Force® Gold™. Molybdenum is also required so that nitrogen can be turned into protein in the plant, via the molybdenum-dependant nitrate reductase enzyme. Protein drives human immunity and plant immunity, so we begin to understand the significance of addressing this neglected little trace mineral. Maximising your access to the "free gift"
I have mentioned the inclusion of legumes, as green manure crops or interplanted lucerne, but there are another group of nitrogen-fixing organisms that provide access to the “free gift” – the 74,000 tonnes of nitrogen gas hovering above every hectare. These are called free-living nitrogen-fixing organisms, and they can often be compromised in home gardens through the biocidal effect of chlorinated water, or because there is a lack of three minerals critical to their viability. These include zinc, cobalt and, of course, molybdenum. Once again, the use of Total Cover™ and/or Life Force® Gold™ will address those deficiencies. It is now possible to reintroduce this free living workforce back into your soils via inoculums containing multiple strains of Azotobacter (the most prolific free-living N fixers). These organisms can be simply watered on in a watering can (e.g., Nutri-Life Bio-N™ from NTS). Plants and their roots contain protein, which contains 17% nitrogen. This nitrogen needs to be recycled when plants mature and die. This recycling process is conducted by soil life. If we can boost and/or stimulate our soil life, recycling efficiency is ensured. This practice also helps to ensure we achieve the desirable 3:1 ammonium to nitrate nitrogen ratio, because this recycled N is in the ammonium form. As mentioned, this critical ratio helps create resilience and stress-free gardening. Every home gardener should have a worm farm. It can involve small, specialist, bucket-like containers, or you can convert an old fridge lying on its back if you want to scale up the operation. You can buy the composting worms from most hardware shops and you start them off with a little pre-hydrated coir peat. 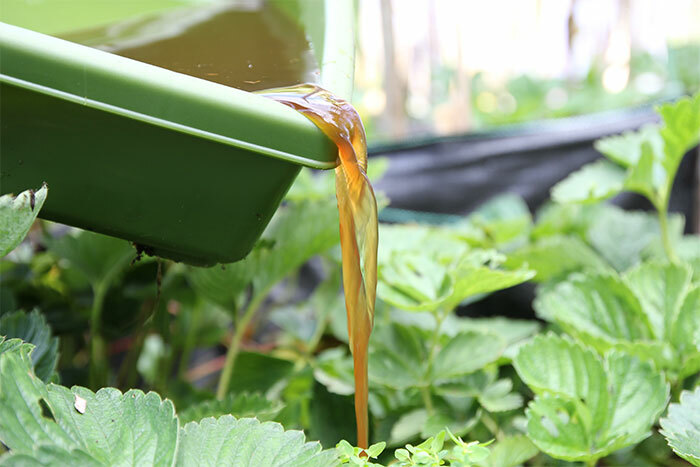 They are fed with food scraps and lawn clippings, and before long you will be able to collect the leachate from your “farm” and you will be amazed at the response. This worm juice contains a vast range of unique, beneficial microbes that are incubated in the gut of the earthworm. If you do not have earthworms in your soil, you do not have this microbe workforce, and you are missing the magic they can deliver. You can also brew up specialist organisms like Micro-Force™ from the Life Force® range. The brewing process is simple. You just add the microbe powder and a little liquid food (supplied) to a bucket of water. This brew is oxygenated for 24 hours with a fish tank aerator fitted with air stones. After this multiplication process is complete, you can apply the billions of new beneficials to your garden with a watering can. Compost is the other obvious inclusion, which can boost the numbers and diversity of your soil life while increasing humus in your soil. A good compost contains up to 5 billion organisms per teaspoon comprising many thousands of different species. You can expand this microbe metropolis even further by making compost tea. We will discuss these things in more depth in upcoming articles in this series. Fungi and bacteria are the key players in your soil team and it is a simple process to keep them happy and healthy. Bacteria love simple sugars, so you can fire them up with something as basic as raw sugar. Dissolve one heaped tablespoons of raw sugar to a watering can of water and apply it to every 4 m2 of your garden. Beneficial fungi feed on more complex sugars, like those found in kelp and humic acid. Life Force® Organic SeaChange™ is a wonderful soil life stimulant containing kelp and liquid fish, and it is also a great source of natural nitrogen that can be foliar sprayed onto your food crops. Life Force® Instant Humus™ can provide the humic acid kick, which feeds fungi and boosts root growth. Humic acid also improves soil structure and boosts mineral uptake, so there are a host of other benefits from this addition. Nutrition Gardening® is a synergistic system where each component has multiple benefits. The interrelated nature of the approach is particularly apparent when we look at practices to perfect nitrogen balance and supply. This article has covered several strategies to boost nitrogen efficiency, but most of them do much more than that. They build your soil health and increase the flavours, medicinal qualities and shelf-life of the food you produce for your family. There will be much more to share in this ten-part series over coming months. Happy gardening!